Time for yet another Konkani recipe.Yeah,ever since I posted the Batata Upkari,I've been trying to post at least one Konkani dish here on a regular basis.It is strange because,I cook the same on a daily basis.But before I post it on the blog,I have to measure the ingredients,note the cooking time and then post because these dishes are cooked with eyeballed ingredients. Bittergourd is not my favorite vegetable.Especially the ones we get in Chennai.Dark green in colour and very bitter compared to the ones we get in Kerala.I believe curries like these were created to mask the strong bitter flavor.Fried bittergourd by itself is so tasty,so imagine dunking it in a coconut based curry.Divine! 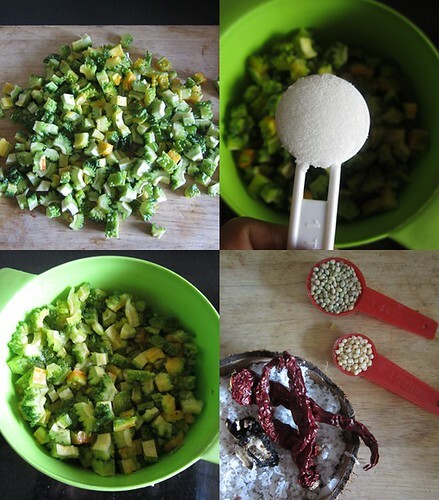 Chop the bittergourd into small pieces,apply salt and keep aside for 10-15 minutes or till you get everything ready. 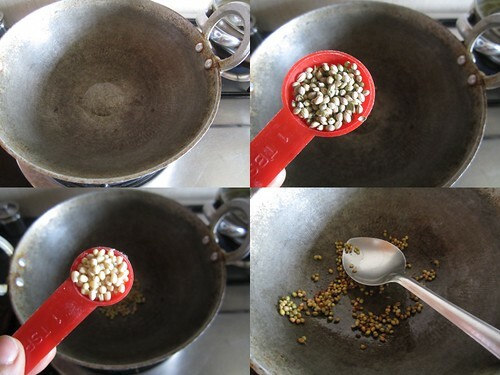 In a kadai add 1/2 tsp of oil and roast the coriander seeds and urad dal till they start turning brown in color.Remove from the pan and let it cool. 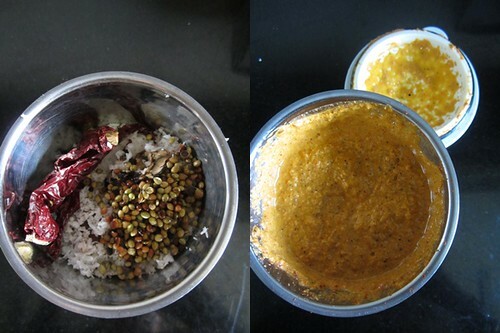 Grind a masala paste using coconut,red chillies,tamarind and roasted coriander and urad dal. 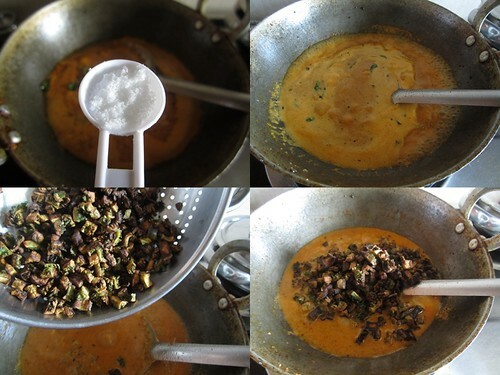 Add enough oil in a kadai too deep fry the bittergourd.Squeeze the bittergourd well and sprinkle it into the oil.You can fry the bittergourd all at once or in batches.Drain to a kitchen tissue and keep aside.Remove excess oil in the kadai. 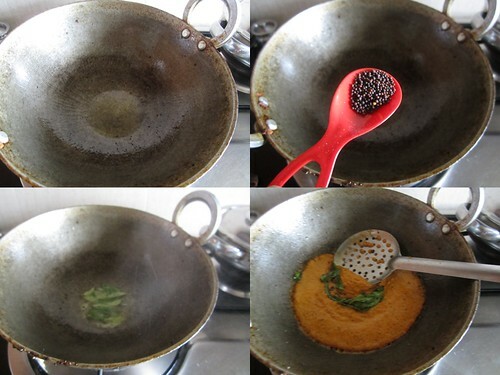 Meanwhile,in the same kadai add 2 tsp oil and splutter mustard seeds and add curry leaves. Mix in the ground masala,enough salt to taste and around 1/4 cup of water and let it boil.Simmer for 5-7 minutes or till the curry becomes thick. Mix in the fried bittergourd and switch off flame. 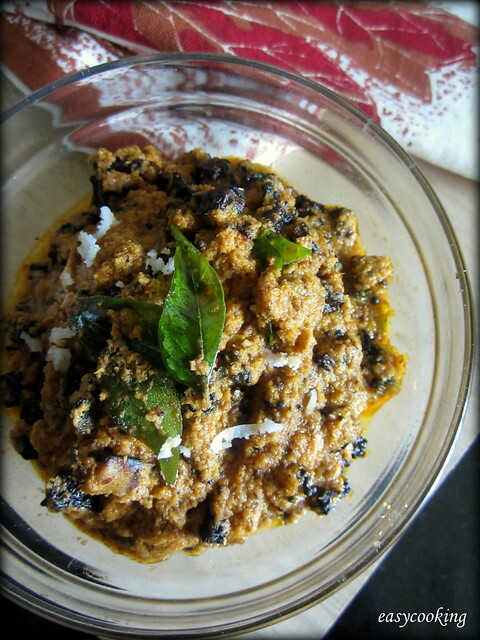 Though it is named a curry,it is more of a side dish.The bittergourd absorbs most of the gravy and becomes a thickish curry. It is best served with some dal based gravy on the side. I like bitter gourd! New recipe here. This curry looks divine. Will definitely make it soon. Very interesting and definitely a super flavourful curry,never cooked bittergourd this way. You can submit your karathe saglen spicy bittergourd pics on http://www.foodporn.net It is a food (and drink of course) photography site where members can submit all food (and drink of course (again) LOL ) pictures that make readers hungry. Hubby is a big time fan of both bitter gourd and coconut, I could eat this veggie everyday too! Your version sounds delicious, I must try this sometime! could u pls tell me wat kind of butter u use. can i use aavin butter (no salt) for ur recp. moreover i need dark chocolate and loaf tin can u pls whr i can find in chennai. Thanks Anon.Yes you can use Aavin butter,that's what I use too.You'll find it in Nilgiris or any other supermarket in Chennai.Or check out special Aavin outlets.For the dark chocolate and loaf tin,check out shops on Waltax road,adjacent to Central station.Shops like Viveka,Venus etc stock such stuff. 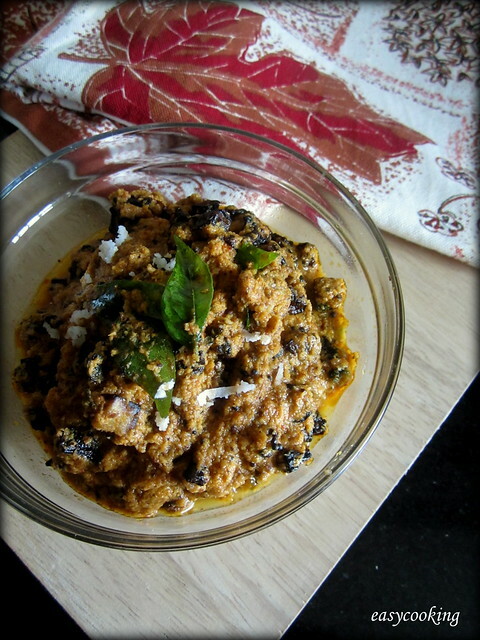 This is a really interesting bitter gourd dish! We mostly eat the deep fried version and it gets boring after some time... This will make for a great variation.